Stiff Arm Steal – Adventure awaits in the Sunshine State! Description: "The prize possession of former football hero, part-time media personality and full-time blowhard BJ Baker has been stolen from his palatial Palm Beach home. Baker has called in the Mayor, the police, the sheriff and everyone else he can co-opt into the search. But if he really wants the person who can find it, one name keeps coming up. Miami Jones. Problem is, he can't stand Jones. And the feeling is mutual. Miami takes on a jealous husband, a feisty ex-con and a police detective desperate to claim everyone else's 15 minutes of fame, and he finds that Florida is home to so many retired athletes he could start a pensioner football league. 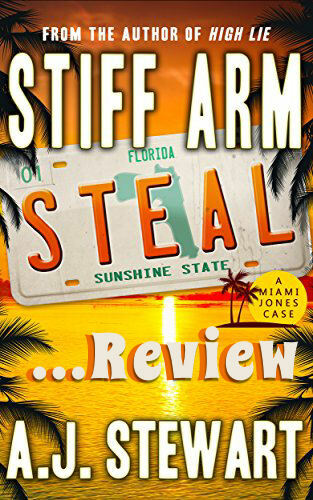 But can Miami hunt down the culprit before they graduate from theft to something far more deadly?…"
5 out of 5 Footballs – Stiff Arm Steal is a TOUCHDOWN!! If you'd like to be notified of book reviews or when fun new content is published, please subscribe with your email, located at the top right hand side of this page! Thank you for reading and I hope to see you soon! This entry was posted in Book Reviews, Kindle Downloads and tagged A.J. Stewart, A.J. Stewart Books, A.J. 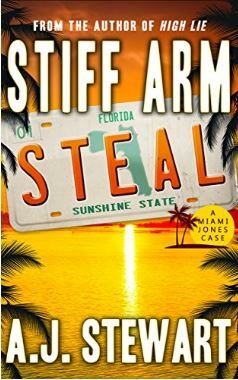 Stewart Reviews, Florida Based Books, florida kindle downloads, Florida Kindles, florida mysteries, Football Kindles, Football Theme Books, kindle downloads, Miami Jones, Miami Jones Downloads, Miami Jones Kindle, Miami Jones Novels, Sports Mysteries, Stiff Arm Steal, Stiff Arm Steal Download, Stiff Arm Steal Review.